We help people to overcome quickly the worst fears, phobias & anxiety. At CTRN: Change That’s Right Now, our mission is to help people improve their lives by removing the fears, anxieties and phobias that keep them from reaching their true potential. We help people with all phobias, from Ablutophobia to Zoophobia, but our most common cases are fear of public speaking, fear of flying, and stage fright / performance anxiety. 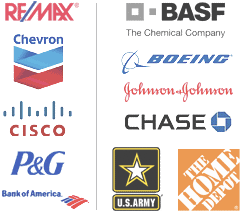 See how we can help you. A recent Gallup poll found that 40% of adults have a fear of public speaking. Comedian Jerry Seinfeld once observed that at a funeral, most people would rather be in the casket than giving the eulogy! Fear of public speaking can cripple your career, since it’s almost impossible to be successful in business without having to speak to a large group at some point. But a debilitating fear of speaking can make this a painful experience. CTRN’s ‘VIP’ & Vanquish Fear & Anxiety CD programs have helped many overcome the fear of speaking in public by getting to its root cause. "Public Speaking is a key part of my work, but for some reason I was stuck. With just days to go before an important presentation to top decision makers in the pharmaceutical industry I was completely lost and extremely nervous. One session with CTRN and the problem was gone. I wasn’t just over my fear of public speaking, I was enthusiastic and full of ideas about how to make it a really great speech – which it was. Now I feel like this about Public Speaking all the time." In today’s global economy it’s impossible to be a successful executive without flying. If you suffer from a fear of flying, your anxiety can put a ceiling over your career. Your phobia can cost you business opportunities, speaking engagements, even promotions. Also known as aerophobia or aviophobia, fear of flying affects an estimated 25 million Americans and the actual number may be higher, since many people hide their fear. A Gallup poll taken after September 11 found that forty percent of people are worried about flying. But you can overcome your fear of flying with no drugs or medication. Our Time Line Therapy techniques have helped hundreds conquer their fear and learn love the freedom of flying. "For over 20 years, I had been living a significantly restricted life, as I was unwilling to fly anywhere. Most business trips were out of the question. I thought of myself as a person who had fear of flying; my fear was part of my identity. I contacted CTRN, because I knew if anything was going to work, it had to be very different than the therapies I had already tried In 5 hours, I was able to change my life!" Whether you call it stage fright or performance anxiety, this crippling fear is the performer’s equivalent to writer’s block. It can stop you cold. The stress of recalling the next line of a performance and the anxiety caused by being on stage can be a powerful combination. Add the fact that a single miscue can mar your performance and you have a recipe for debilitating stage fright. Nearly every musician has had a bout of stage fright at some point in their career. Many of the world’s most famous performers have had to deal with periods of intense fear. Stage fright kept Barbara Streisand from performing for twenty-seven years. Singer Donny Osmond suffered acute attacks of performance anxiety before concerts. 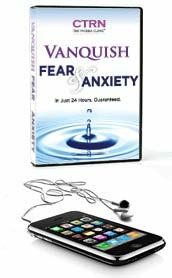 Our Vanquish Fear & Anxiety home study program has helped many performers overcome stage fright by helping them relax and visualize success. Many describe it as a liberating experience. Read just one example. "I worked with CTRN’s Phobia Clinic [for my stage fright], and was able not only to undertake the performance, but to really enjoy it, concentrating on and taking pride in my performance instead of sweating and shaking for days beforehand In just a few minutes the technique you used enabled me to overcome a problem that I have had for virtually all of my life." While fear of flying, fear of speaking in public, and stage fright are the most common maladies we deal with, we’ve helped people beat phobias such as claustrophobia, emetophobia, fear of spiders, and even fear of the devil. Our master list of phobias catalogs over 500 phobias. How can we treat such a wide range of fears? All phobias are ultimately the same fear and flow from the same root cause. Our approach gets at the source of these fears and break the cycle of negative thinking. You really can create the life you love.